If your intent to reclaim your health through juicing, it would be great to go for a masticating juicer. When buying a juicer, choose one that will serve you the most natural and nutritious juices each single time. The Aicok Slow Masticating Juice Extractor offers the highest performance of any model tested in the market. Think and rethink, for what purpose you want to use your juicer and then select the best one that is affordable. You don’t want any hassle and therefore, select one which is easy to use, assemble, disassemble and clean. Ultimately, you must select a juicer that suits your need and meet your budget. Aicok Slow Masticating Juicer Extractor is an efficient selection that can fulfill all of your requirements. Although you may be confused due to different types of this juicer, this crush review can assist you to stable your buying decision. This section will cover the important features of Aicok Slow Juicer. The following features can help people to learn more about this juicer and assist in decision making. This is purely a masticating juicer and due to that, it produces high nutrient fruit and vegetable juices. It is also a perfect juice extractor for any leafy greens. It provides amazing juices for almost any type of ingredients. Due to its slow speed, juices are very much healthy. The preservation of juices is also easy in the refrigerator for anyplace less than 72 hours. The Aicok Masticating Juicer comes with auto pulp-ejection for continuous operation. Its heavy-duty juicing screw, environmentally friendly materials make this juicer much healthier. The operation of this convenient juice extractor is simpler and quicker, runs much silently. It runs with DC motor, so there is a short delay to run it for a safe and secure Motor protection. It has a safe and sound reverse function, press on “R” switch to stop clogging. Overall, protection system is effective and enough safer. Many of the juicers produce loud disgusting sounds, but fortunately, Aicok Extractor is quite silent. Every type of juicing is done only within 60 decibels. It has 80 rpm lower speed that ensures quality juices and quiet operating system. No doubt, it’s a great choice for mom who has a baby! 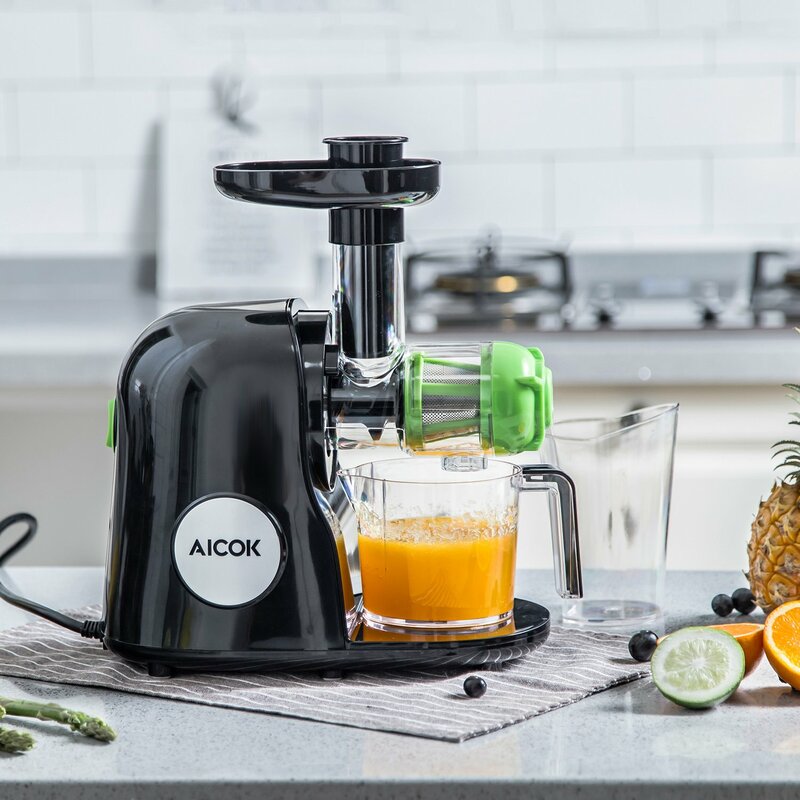 The Aicok Slow Masticating Juicer extracts more minerals, vitamins, and enzymes compared to centrifugal juicers. 80 rpm lower-speed means no clogging or extra heat; it also prevents oxidation and so it’s much healthier. It’s dishwasher-safe, super easy to assemble, disassemble, operate, and clean-up. The juicer is perfect for fibrous vegetables, barley grass, wheatgrass, and all types of leafy greens. Due to its low-speed motor, juicing speed is lower. Sometimes larger ingredients like banana must be cut before placing them in the juice extractor. 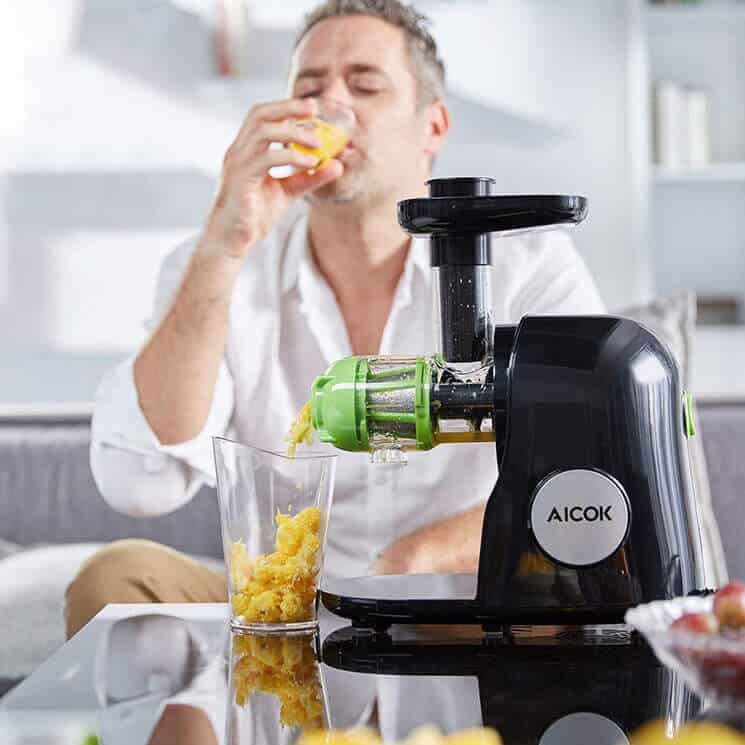 Aicok Slow Juicer extracts juices efficiently from fibrous vegetables including celery, Wheatgrass, ginger, barley grass and any type of other leafy greens. This Juicer is basically perfect for juicing, but sometimes it can be used to make almond milk. Using large pieces of fruits is not recommended. Cut fruits and vegetables in small pieces and put them inside the juicer for a better result. We do not recommend crushing butternuts or other nuts. 1. 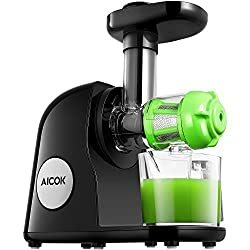 Is Aicok juicer suitable for juicing ginger root? # Yes, it works great for ginger root. 2. Is this juicer dishwasher-safe? # Yes, this is dishwasher-safe masticating juicer. 3. How much time it takes to clean-up? # It’s super easy to clean up this juicer. It is required to take the different parts apart and then clean up, about 10 minutes to finish cleaning. 4. How does it manage soft ingredients? # It perfectly works for soft fruits like strawberries, melons, and blueberries. The Aicok Slow Juicer is one of the top quality juicers in the products lineup today. It’s the perfect choice for the health-conscious people who like a larger variety in their juicing habit. The technology and operating system in the Aicok Slow Masticating Juicer Extractor prevents oxidation, heat build-up and provides healthy juices.